In 1906 Hermann Fast came to the Petrofka school to teach the Russian language and to conduct worship services in the school and in homes. People who attended these services decided to build a church in the country. Wasyl Wasilenko and his brother-in-law Nicholas Boulanoff, whose farms were adjacent to each other in the Harmonia district, each donated an acre of land for the church site. The structure was completed in 1912. In 1918 Wasyl Wasilenko was ordained as minister and Paul Makaroff as deacon. After Wasilenko moved away in 1924 the Mennonites at Blaine Lake joined together with a local Russian Baptist congregation to form one church. Baptist minister George Buzowetsky served as pastor and Makaroff continued serving as deacon. The church formally adopted the name Baptist Mennonite Union Church of Blaine Lake. In the 1940s the members decided to move the Mennonite church from the Harmonia District to the town of Blaine Lake. The building was moved to 107 Railway Avenue West. From 1944 to 1956 the church was under the leadership of John Koval, a local storekeeper, who conducted services in the Russian language. When the church membership grew members built an addition to the existing building. Services in the 1950s were in both Russian and English languages. By 1959 the Russian-speaking people met separately and services at the church were in the English language. The church went through several name changes. At first it was a Mennonite Brethren Church at Petrofka. It became the Baptist Mennonite Union Church of Blaine Lake when the two congregations worshiped together. When the Baptists moved away the name again became the Blaine Lake Mennonite Brethren Church. Then in 1967 to encourage attendance by people of all denominations the name was changed to Blaine Lake Gospel Chapel. A new fellowship hall was completed in June 2009. In 2009 the average attendance was 60-70. Mennonite Brethren Herald (27 May 1988): 68; (May 2008); (January 2011): 28; (April 2012): 24. Penner, Peter. No Longer At Arm's Length: Mennonite Brethren Church Planting in Canada. Winnipeg: Kindred Press, 1987. Available in full electronic text at: https://archive.org/stream/NoLongerAtArmsLengthMBChurchPlantingInCanadaOCRopt?ref=ol#mode/2up. 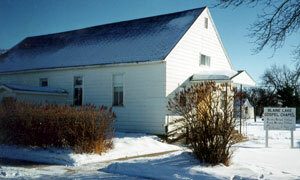 Centre for Mennonite Brethren Studies, Winnipeg, MB: Volume 603. Epp, Marlene and Sam Steiner. 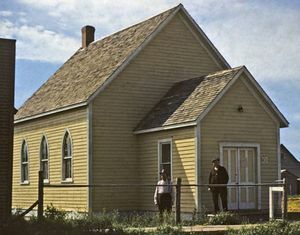 "Blaine Lake Gospel Chapel (Blaine Lake, Saskatchewan, Canada)." Global Anabaptist Mennonite Encyclopedia Online. April 2012. Web. 20 Apr 2019. http://gameo.org/index.php?title=Blaine_Lake_Gospel_Chapel_(Blaine_Lake,_Saskatchewan,_Canada)&oldid=163600. Epp, Marlene and Sam Steiner. (April 2012). Blaine Lake Gospel Chapel (Blaine Lake, Saskatchewan, Canada). Global Anabaptist Mennonite Encyclopedia Online. Retrieved 20 April 2019, from http://gameo.org/index.php?title=Blaine_Lake_Gospel_Chapel_(Blaine_Lake,_Saskatchewan,_Canada)&oldid=163600. This page was last modified on 11 March 2019, at 01:59.